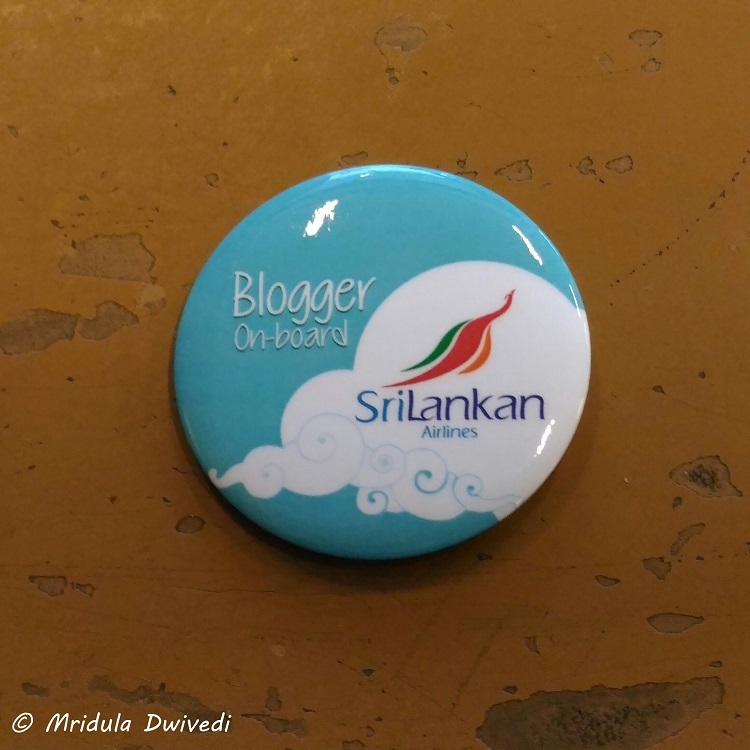 Srilankan Airline- Blogger on Board! 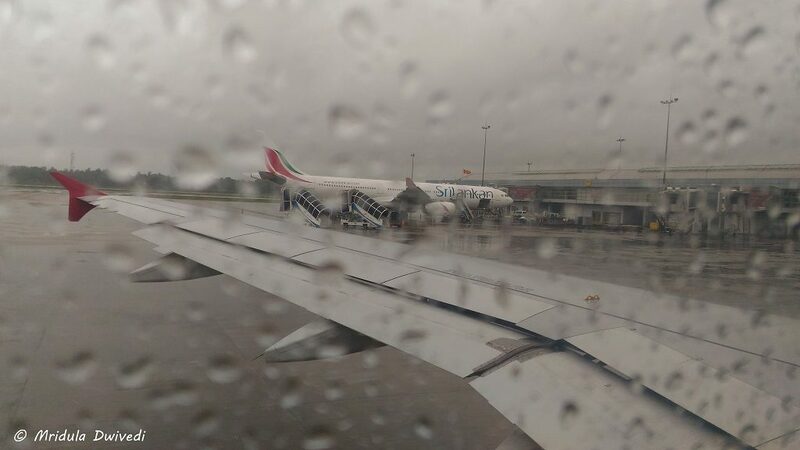 I recently flew Delhi-Colombo-Delhi with SriLankan Airlines. I was going to Sri Lanka to attend the TBC Asia 2016 with Cinnamon Hotels. The fun started at the check in. I was given an envelope and there was something in it for me. I had ample time before I was to board the flight, so off I went roaming around T3. When I came to the boarding gate for my Colombo flight with Srilankan Airline, I opened the envelope. I found that it had a badge which said- “blogger on board!” That was passport to fun on the flight! I was given a first row window seat in the economy class. The hostess serving in the business class came in to say hello. She also serve me champagne from the businesses class to me. She asked if I needed a refill after the second glass and I politely declined. The food was good, the sky still had the remains of the sunset and I had a comfortable seat! In fact I had a comfortable flight throughout. It was a 3 hours flight to Colombo. When I landed at Colombo, I was met by a member of staff, a young girl with a placard with my name. She saw me off till the arrival area where I was received by another member who would take me to the Cinnamon Lakeside Hotel. I had a lot of fun in Sri Lanka but of course those are separate posts. 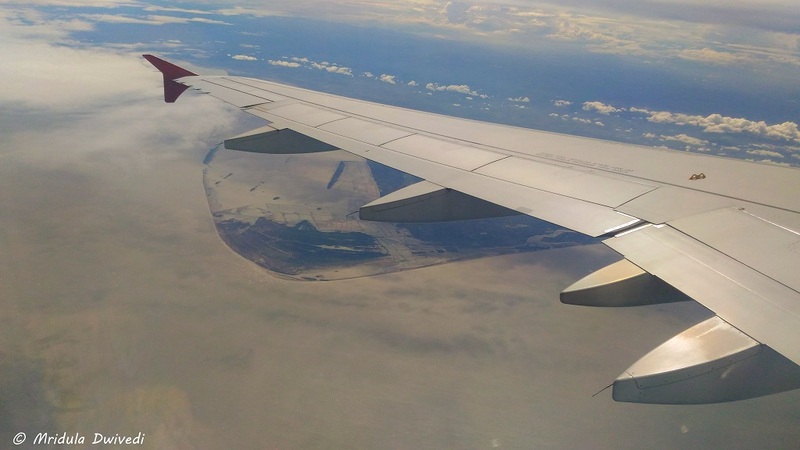 This post is about Srilankan Airlines and it makes sense to talk about my return flight right here. I was dropped back to the airport in good time. I had a day flight from Colombo to Delhi. I had a gala time at the airport looking for souvenirs, doing some impulsive shopping and then indulging in a cheesecake and coffee. 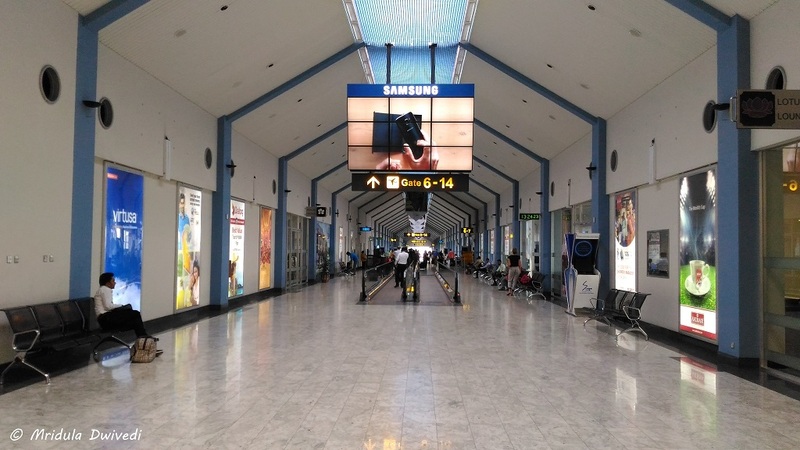 When I entered the airport it was quite crowded but within an hour it became reasonably empty. The Beautiful takeoff from Colombo! When my flight was announced this time, there was no badge identifying me as a blogger and yet I got the same good service minus the Champagne from the business class. The takeoff beautiful, my meal good and the staff courteous. I quite life the dress of the women cabin crew of SriLankan Airlines. I had a good time watching a Japanese movie on my return flight. While going I had watched Piku. Overall Srilankan Airlines took good care of me on both the legs. I remember them so well because my first ever flight in my life was with them when I went to Singapore in 1999. It is good to see that the airline has become more luxurious in the intervening time frame. I hope I will get to fly with them again. PS. My flight was arranged by Srilankan Airlines in collaboration with Cinnamon Hotels. My Stay at Pench Tree Lodge with Pugdundee Safaris When Things Go Wrong While Traveling! 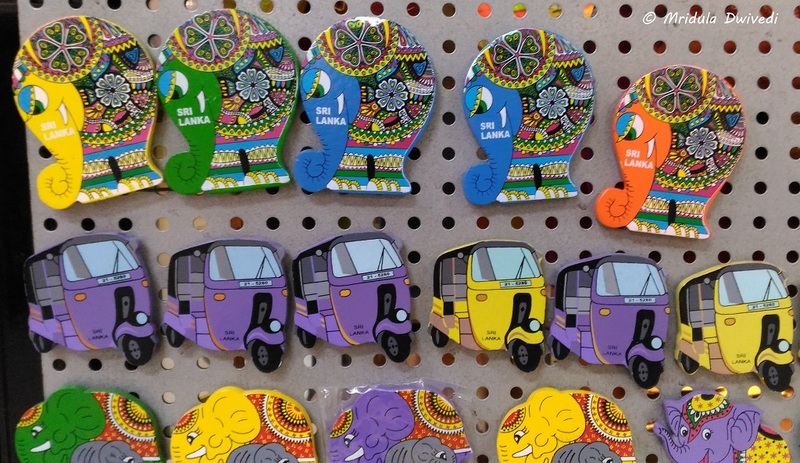 I will love to have those elephant and auto magnets. Did you buy any? Yes I did but the mask ones not shown in the picture! i think you should had to take the second glass of champagne—ha ha ha . 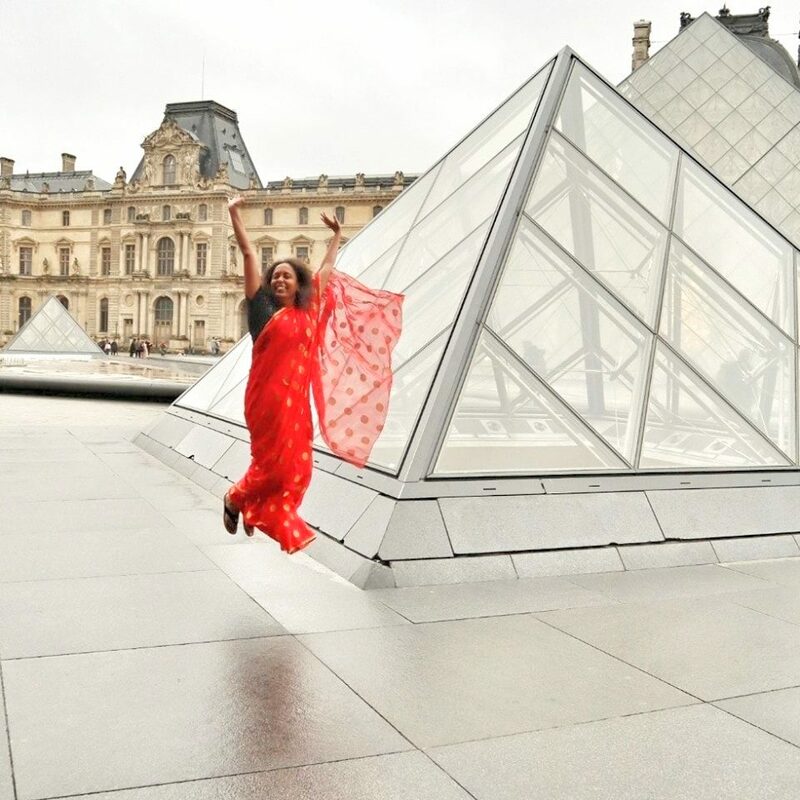 good to read about your experience with beautiful pics. That is a good experience! The pics are wonderful too. I was extremely disappointed when I flew this airline as they refused to serve economy class passengers any alcohol other than Beer. It was a Diwali day and flight was empty so I called the head Stewart and told him about my disappointment. I was travelling with my dad who likes to have 2 small drinks of whisky each evening. we were then served a drink as if a big favour was being done. Sorry to hear about hat Rohin. While coming back there was no blogger identification with me and yet I got my wine. I was wonder what was wrong when you flew! Thank you so much Niek! This airline has changed a lot in the last decade, good to see such wonderful experience. Yes Subhadip the flights were pleasant with Srilankan Airlines! Souvenirs at the Colombo Airport are very beautiful . I would purchase these for my children but I m not Colombo. It was overall a warm welcome for a blogger at the airport as you mentioned.